The Ocean Rodeo Soul looks like a great piece of kit which has clearly had a great deal of thought, expertise and development put into it. It's packed with features including a self-entry dry zip, pee-zip, detachable hood, music player pouch, harness hook pass-through and neoprene pockets for keeping your hands warm. It's a very tidy suit in the looks department, and looks to be well reinforced in the usual wear areas such as bum, shins and knees. The Soul features a dryzip which I've never come across before - it goes over the top of your shoulders and behind your neck, meaning you get it on and off with ease without the help of a passer-by. It does take a little bit of effort to get your shoulders through the zip aperture in order to get the suit on, but once you've done this, the rest is childs-play. The positioning of the dryzip is such that once the suit is on you cannot notice it at all, giving you great freedom of movement. Anyone new to the world of drysuits will surely take a little bit of getting used to getting the seals over your feet and hands, but this is true of any suit out there on the market. It also comes with optional internal braces, which I chose to remove, as it sits in place just fine without them. The Soul also allows you to put your waist harness on underneath the outer jacket, which is a nice feature, especially when you use the pass-through hole to connect yourself to the chicken loop. I'd chosen an ideal day to take the Soul out on its first outing - 2 degrees Celcius, 25mph of wind, and a forecast of snow, and it certainly did me proud - warm and dry after 4 hours on the beach, and the breathable fabric had clearly done the trick as there was no dampness to be found on my clothes. I'd given it a very thorough test, not just mowing the lawn and taking it easy, but out in the 4ft waves and several decent wipeouts when the handlepasses didn't quite come off! As with all drysuits, I was wearing boots and gloves over the seals, which does a great job of eliminating any water being forced up under the seals. I was a little concerned that the Handlepass leash may get a little snagged up underneath the jacket, but was pleased to see no such issue. The harness pass-through hook is great if you're going to stay hooked in all the time, but you can lose your hook inside the jacket occasionally if you're unhooking a lot. The weight of the suit is also a real benefit as it doesn't hinder boosting or make landings any heavier than they'd need to be, and the loose fit gives great mobility to fully express yourself out on the water. The detachable hood is very handy for when a wintery shower comes through, or after you've taken a face plant into the icy depths and want to keep the wind off for a while. The pockets are also great for storing your gloves if you get too hot and need to cool down a bit. 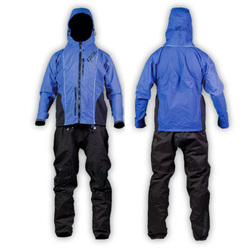 A great premium drysuit loaded with features, which will keep you warm and dry out on the water when your buddies are packing up due to the cold! It looks great out on the water, and also wouldn't get second looks if you did your shopping in it. If you want to get the best out of every winter session, you've gotta have one of these in your arsenal!